‘Tis the season for frights and delights, as Food Network rolls out two returning series, one all-new competition, plus five sensational specials capturing the Halloween spirit for over 20 hours of thematic holiday programming. 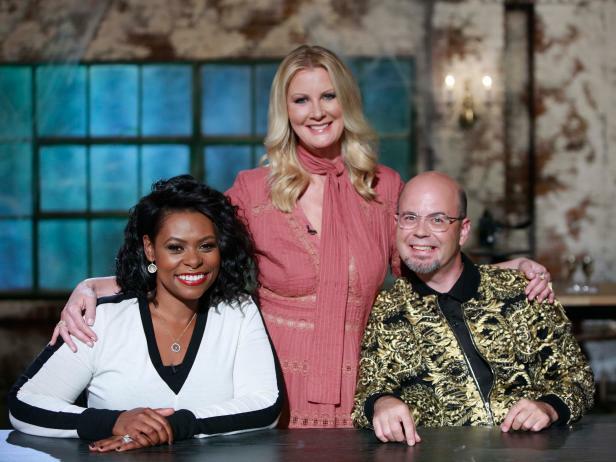 The lineup features new seasons of fan-favorites Halloween Baking Championship and Halloween Wars, along with new Halloween-themed specials featuring some of Food Network’s biggest stars, including Duff Goldman and Trisha Yearwood. And don’t miss new series Haunted Gingerbread Showdown, as Food Network celebrates the scariest, and the most wickedly-delicious holiday of the year. Halloween Baking Championship returned on Monday, September 24th at 9pm ET/PT and is filled with more hauntingly delicious treats. Comedian John Henson, along with judges Carla Hall, Lorraine Pascale, and Zac Young test the skills of eight talented bakers as they show off their creepiest, scariest skills over six episodes with bone-chilling challenges. From spider web desserts to towering confections of terror, only one will frighten the competition for a chance to be featured in Food Network Magazine as the winner of Halloween Baking Championship, along with the $25,000 grand prize! On Sunday, September 30th at 8pm ET/PT, viewers got a behind the scenes look at the weeks and months leading up to the best pumpkin carvers, cake and sugar artists entering the Halloween Wars kitchen, on Road to Halloween Wars. Year round, these gleefully ghoulish geniuses work to hone their craft, with dreams of supreme victory. From points near and far around the globe, find out who has what it takes to be chosen to compete in the new season of Halloween Wars, which premiered on Sunday, September 30th at 9pm ET/PT. 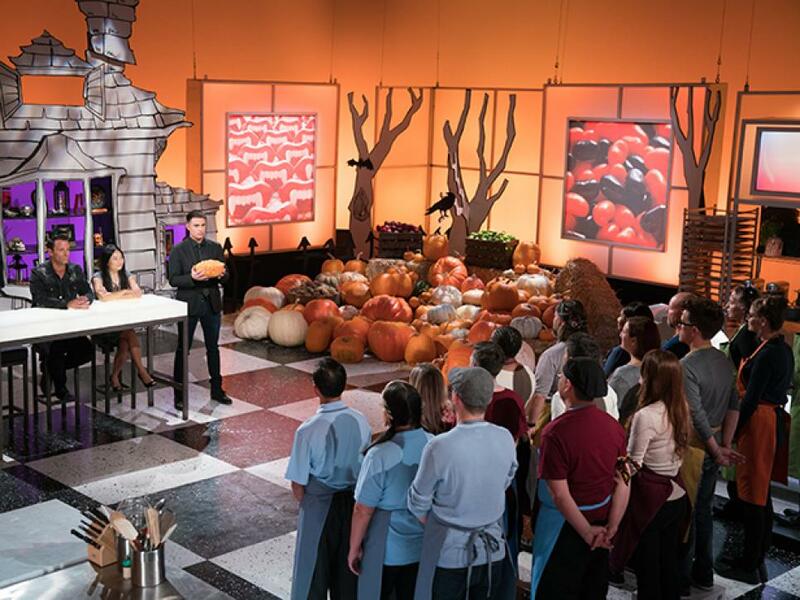 Jonathan Bennett returns to host as six teams each made up of an expert pumpkin carver, a cake artist, and a sugar master battle it out over five episodes to create Halloween-themed edible displays that are as scary as they are delicious. Each teams’ creations are judged by award-winning cake decorator Shinmin Li, horror film special effects master Todd Tucker, and a rotating panel of celebrity guest judges, including movie director Mick Garris, Gaten Matarazzo (Stranger Things), and more, to determine which team takes home the grand prize of $50,000! And don’t miss Halloween Wars: Even More Monstrous Scares, which premiered Sunday, September 30th at 10pm ET/PT. Each Halloween for nearly a decade, the world’s greatest pumpkin carvers, cake and sugar artists have joined forces to bring to life the most mind-blowing and terrifying Halloween creations imaginable, as they compete for the grand prize. It’s time to dig up even more of the creepiest ghosts, scariest witches, werewolves, yummiest treats, and most mind-blowing displays in the history of Halloween Wars. This Halloween, Food Network is putting the haunted back into haunted house with the thrilling competition Haunted Gingerbread Showdown, premiering Sunday, October 7th at 10pm ET/PT. Over four episodes, host Sandra Lee pits nine of the best gingerbread artists in the country against each other to create spooky gingerbread masterpieces that embody the season. Judges Jamika Pessoa and Jason Smith are joined by rotating judges, including the “Mistress of the Dark” herself, Elvira, to determine the winners of the first three heats, who will square off against each other in the finale for a chance to win the ultimate Halloween treat — $25,000 and to be featured in Food Network Magazine. But beware, these aren’t your grandma’s cute gingerbread houses. With surprises lurking around every corner, these wildly haunted original creations tell a darker story. There are even more outlandish and spooky cakes on the hour-long special Halloween Cake-Off, premiering on Monday, October 8th at 10pm ET/PT. 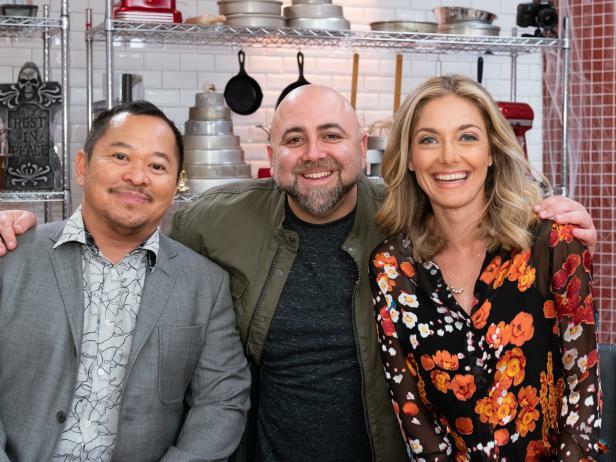 Cake master Duff Goldman hosts this unconventional competition where four professional bakers must prove their expertise in the studio kitchen and within their own bakeries. For the first challenge in the studio, the bakers create cakes incorporating a surprise selection of candies and treats, but one will be ghosted from the competition. With three remaining bakers, they head back to their bakeries to design, bake, and construct an elaborate Halloween-themed showpiece cake that transforms from good to evil by either moving, bursting, shattering or even melting. The one that impresses judges Waylynn Lucas and Pichet Ong with presentation, transformation, and taste, will take home $10,000 and be crowned winner of the Halloween Cake-Off! 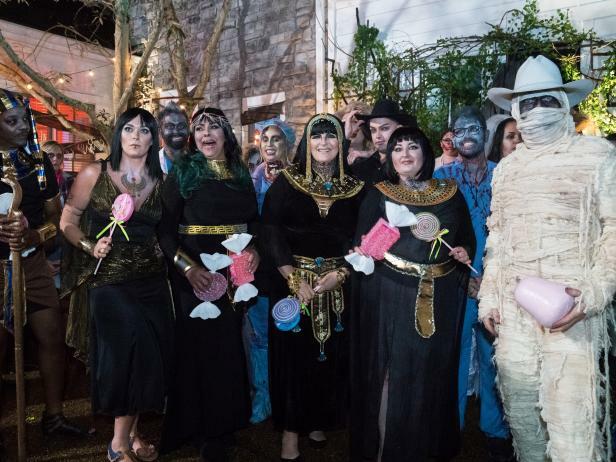 Trisha Yearwood is throwing her biggest party ever for her favorite holiday on Trisha’s Halloween Spooktacular, premiering Monday, October 15th at 8pm ET/PT. Join Trisha as she shares eye-popping tricks and treats for the ultimate Halloween party. Along with her best friends, Trisha goes into full preparation mode for the ghoulish gala, from trying on costumes to preparing her most elaborate Halloween-themed dishes to checking out Nashville’s most popular Halloween-themed bar, Trisha’s guests will experience a night they will never forget, ending with a Zombie-filled, candy-coated Halloween jam! Check out FoodNetwork.com for your Halloween destination to watch exclusive clips, browse photo galleries, and meet the judges and teams from #HalloweenWars, #HalloweenBakingChampionship, and Haunted #GingerbreadShowdown. And don’t miss recipes, entertaining Halloween tips, and expert advice from your favorite stars – guaranteed to make your holidays go creep in the night!